Gotham remains interesting to watch, just to try and suss out what in the world they're thinking in the writer's room. * The Kringle/Nygma stuff is super weird, like it belongs on another show. Even the musical cues seem to indicate that. * Happy as I am to see less of Barbara, I have no idea what's up with Gordon getting together with Dr. Thompkins. Was that a thing in the comics, or are they maybe heading toward full alternate continuity? * The Maroni stuff was also weird. I don't really get why he wouldn't just beat some answers out of the Penguin, rather than going camping. That said, the spectacle of Penguin frantically making phone calls from inside a car crusher was pretty funny, especially when he called the guy running the crusher, just totally nonsensical. * Did the guy who came to kill Fish just run out of bullets? I mean, I'm happy to see her alive, but... what was that? Anyway, looking forward to next week's installment of WTFery. 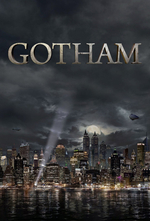 I'm starting to think of Gotham as "Batman: the Mad Libs Years." I genuinely love Gotham, but I think that would be impossible if I tried to contextualize it into the Bat-mythos (of any variety). Is Kringle part of an establish storyline? I couldn't work it out from some cursory Googling. I dunno, I like fruitless speculation here. Like, it'd be fun if this was a universe where Bruce Wayne *didn't* end up as Batman. Hypothesis: Kristen Kringle, after developing a relationship with Ed, will be kidnapped by Calendar Man around Christmas, and die in a failed rescue by Gordon.